Born at Almonte, Ontario on 24 May 1904, he served as President of the Manitoba Historical Society for two terms, from 1934 to 1935, and again from 1938 to 1944  one of only three people to have done so in the history of the Society (the other two being George Bryce and Charles Bell). 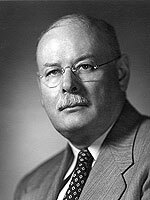 A graduate of Harvard, he became a member of the history department of the University of Manitoba in 1930, after teaching appointments at Harvard, Radcliffe and Simmons colleges in the United States. He remained on the faculty of the university until the outbreak of the Second World War and is remembered by a generation of students as an outstanding scholar and teacher. After military service (he rose to the rank of lieutenant-colonel in Canadian Intelligence in Britain), he was appointed deputy minister of education for Manitoba  a position which he held until 1953, when he became the founding Director of the School of Public Policy and Administration at Carleton College (now Carleton University) in Ottawa, a position that he held until his death. In the late 1950s he returned to Manitoba as Chair of the Royal Commission on Education which is associated with his name. He died on 13 February 1971 and was buried at Almonte, Ontario. “To study our education set-up”, Steinbach Carillon News, 31 May 1957, page 2.